I finally got a few photos of the artwork installed in the memorial from my friends at Formations, Inc. The client was very happy with how it all turned out. Installed illustration of the Wright Brothers Memorial behind the welcome desk. In the distance through the window on the right is the memorial. Illustration for the panel showing the Wright Brothers wind tunnel. That boxy thing behind the glass is a replica of the original. 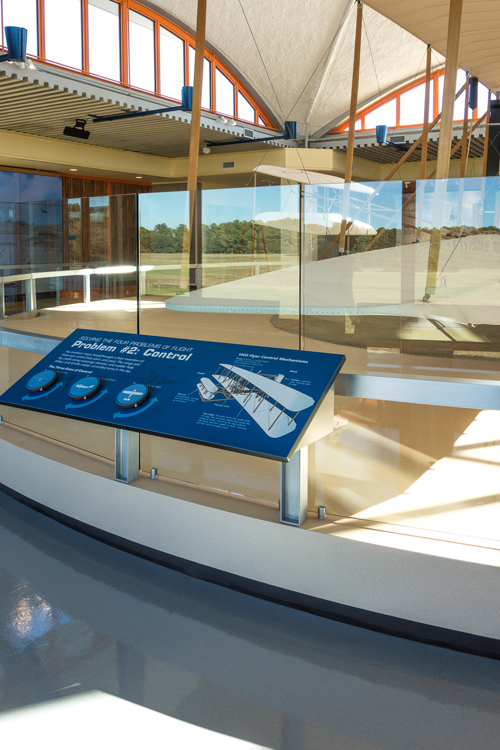 Illustrations of the plane and how it flew are on this panel in front of a full size replica of the flyer. While you’re here, check out the rest of my website. Please like, comment and share this post! Then follow me on Facebook. Thanks! ← Four great quotes on aging creatively. Can’t wait to go see it in person! We saw your work at the Steinbeck museum and we’re sure this will be as impressive! Keep up your good work, Gary.